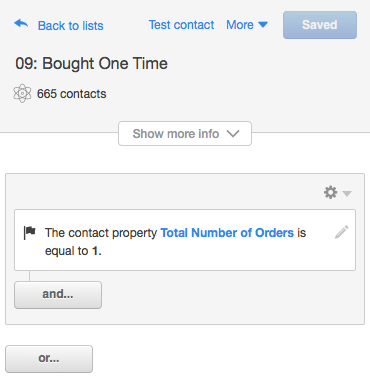 We have created a series of smartlists to track where each and every contact is at in the buyer's journey. This one explores all new customers whose "total number of orders" equals 1. Note #1: This Smart List currently isn't being built in Revenue Conduit's Marketing System for Hubspot. You will have to re-create this Smart List manually using the Default Settings screenshot, below.